Not to be confused with Snow Rise. 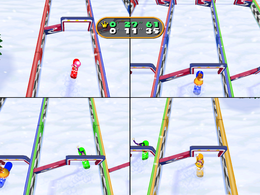 Snow Ride is a 4-player minigame in Mario Party 7. The minigame's name is a pun on a song called Slow Ride. The camera shows the entire course before focusing on the players. The characters ride on snowboards and have to navigate through gates through low walls that alternate from side to side. Although the pattern is easy to anticipate, players are provided less time to move in the later sections of the minigame, due to the placement of the gates being closer together. There are also Warp Pipes that serve as obstacles every now and then. The four players appear on a podium, with the winner's place raised above the rest. The winner does their victory animation. Rules – "Catch air on your snowboard as you race downhill, but don't hit any obstacles." Advice – "The gates alternate sides, so use that knowledge to prepare for what's coming next." This page was last edited on March 27, 2019, at 01:17.